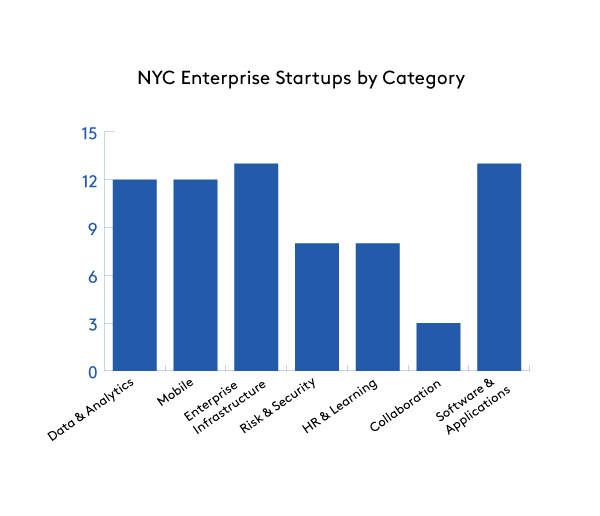 Using data from the Work-Bench Enterprise Startups Funding Database, CrunchBase, and other sources focused on NYC, I created a master list that represents enterprise technology companies that meet our definition of enterprise and have raised outside money. 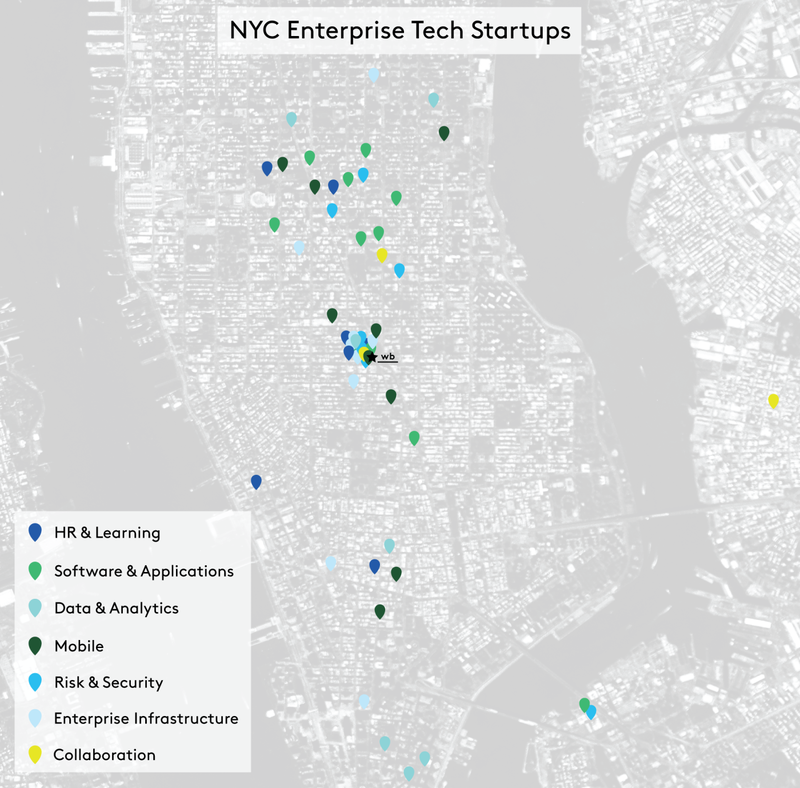 I looked at the lesser known elements of our NYC enterprise tech scene, with an emphasis on data and analytics, mobile, enterprise infrastructure, collaboration, risk and security, HR and learning, and software and applications. Note that I omitted fintech and marketing tech startups for this post since they’ve received a fair amount of attention historically. Also, while we have a flourishing B2B SaaS scene, if a company only sells to SMBs (and not the Fortune 1000) they were omitted from this particular list. You can see the full list of companies here. Four interesting trends emerged from surveying the landscape. Between the rapidly growing IaaS startup Digital Ocean, emerging companies working with containers such as Tutum and Quay.io (which was acquired by CoreOS and now represents CoreOS’s NYC team), monitoring companies like Appfirst and the super hot Datadog (which recently raised a $31 million Series C), and BetterCloud’s cloud app-management platform, if you blinked you may have missed that NYC isn’t messing around when it comes to the future of IT infrastructure. We’re fresh off Nodejitsu’s acquisition by GoDaddy and have some new players like Bowery, Backtrace I/O, and NSONE, too, so keep following this space closely. Likely due to the varied industries we have in NYC, vertical focused mobile solutions are emerging. Handshake is disrupting the wholesale sales ordering and fulfillment industry, VTS and Hightower both use mobile to rethink commercial real estate leasing, Monaeo leverages mobile and location to provide auditable tax data, Kasisto enables intelligent conversations for mobile banking apps, Enhatch offers better tools for the mobile sales professional, Lua makes mobile messaging a breeze, and FieldLens provides project management tools for the construction industry. These vertical mobile apps have raised $80 million and are enabling business to be done quicker and more efficiently on the go. We also have tools such as Appboy, Carnival, and mParticle to help mobile developers build and market their applications. Last year saw a great exit for NYC when Divide was acquired by Google for $120 million. The uninformed may think that HR is a staid industry, but don’t tell that to folks like Namely and Greenhouse, which offer tools for HCM and recruiting, respectively. Both are also experiencing tremendous growth, which they’ve parlayed into new funding rounds: This week Namely raised $11 million in new financing at double its valuation from just three months ago when it raised a $12 million Series B, and Greenhouse raised a $13.6 million Series B led by Benchmark after raising its $7.5M Series A in August. We also have Pymetrics, which applies neuroscience to hiring, Hirepurpose, which helps veterans find employment and Pathgather, which helps enterprises improve their learning management system platforms by leveraging content from MOOCs. True Office, which turns outdated training content into interactive courses, was acquired by NYSE in November, and there are several later-stage companies such as Jibe and PeopleDoc, which call NYC home, as well. It should come as no surprise that NYC has many mature data and analytics companies given how many large corporations here need to derive business value through their data. While MongoDB is NYC’s enterprise startup poster child with $311 million in funding and a $1.6 billion valuation, we also have companies like Syncsort (which has $75 million in revenue for its Hadoop and mainframe ETL tools), Sisense (which has raised $44 million for its business intelligence tools for non-techies), and 1010data (which has raised $35 million for big data discovery and data sharing), which are established players with significant enterprise customer bases. 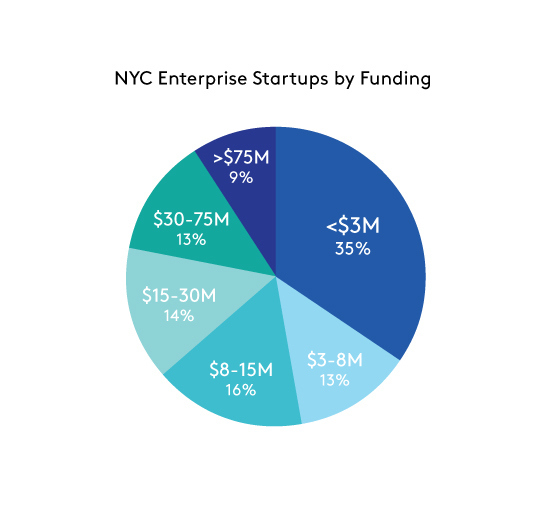 Despite these later-stage players in NYC, the funding continues to pour into earlier-stage data and analytics companies, too. We have platforms, databases and data sets for big data analyses. These include Yhat’s platform for data science teams to operationalize their models more efficiently, InfluxDB’s time series database, and Enigma enabling business value to come from public data sets. And don’t forget predictive analytics, machine learning and AI. Augury’s predictive maintenance tool identifies machines in need of repair, Fusemachines’ machine learning technology improves customer experience, and Amy is x.ai’s friendly virtual personal assistant who helps schedule meetings for you. This year has potential to be a big funding year. We have 26 companies with under $8 million in funding raised to date, 17 in the $8 million to $30 million category, and 12 with over $30 million raised. I expect that more west coast VCs will take notice and we’ll see a lot of Series A, B, and C deals get done. This will be a continued boon for our startups, as the funding will fuel additional growth and put our NYC companies in the national spotlight. This year may also see some enterprise IPOs for NYC. Sprinklr, which offers a social media management platform that enables enterprise brands to connect with customers across every touchpoint, is likely targeting an IPO this year. High flying companies like Datadog, Sisense, and Dataminr could potentially IPO late this year or early next year if their tremendous growth continues. And of course there’s MongoDB, the NoSQL database company that is NYC’s highest funded and highest valued enterprise startup, that is a potential candidate for a 2015 IPO. Thanks to David Aronoff (Flybridge), Rachel Solomon (First Round Capital), Shivon Zilis (Bloomberg Beta), and Lenny Pruss (RRE) for sharing valuable feedback on the post and suggesting some companies I missed during my research. True Office and LayerVault are Work-Bench Ventures portfolio companies. BETTER, Bowery, Fusemachines, Enhatch, Honey, Kasisto, Hirepurpose, Monaeo, Nodejitsu, Mortar Data, Socure, and Pymetrics are members and/or alumni of Work-Bench’s enterprise technology community, but Work-Bench Ventures has no ownership in the companies.